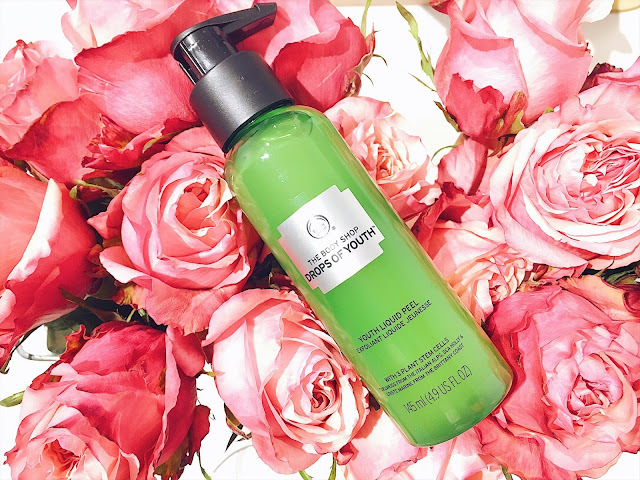 Be prepared to be awed by The Drops of Youth Liquid Peel from The Body Shop range if you're wanting a gentle exfoliation and peel treatment for your skin...more below. Have you guys heard of the Drops of Youth Liquid Peel by The Body Shop as yet? It's a product that contains three plant stem cells including Edelweiss, Sea Holly and Criste Marie. Essentially it's about looking to exfoliating, lifting and peeling away the dead skin cells which exist on your skin. Furthermore, the peel looks to smooth out your skin using its gel to peel technology. There are no harsh beads present in the Liquid Peel which means that the process of achieving youthful looking skin is more gentle and easier now. How the liquid peel works is that it looks to remove any impurities from your skin and leaves it feeling refreshed, clean and feeling rejuvenated. Also, I quite enjoyed using this Liquid peel because it was less abrasive on my skin and it allowed my skin to look more radiant and brighter after using it. Additionally, I felt that it helped with the minimisation of my smaller blemishes that appeared on my forehead and chin which was great to know. Facial peels (especially in the form of a gel based) is the most gentle way to cleanse your face thoroughly if you're after a gentle exfoliation feel. The Liquid peel did not leave my skin feeling dry or irritated which meant that this product was very gentle and safe to use on my skin. The Liquid Peel is the latest edition to the Body Shop range which I have been so far enjoying. Moreover, to use the Liquid peel by The Body Shop, I would simply pump twice to dispense the gel onto my fingertips and massage this onto the face until you start to see clumps forming. Then all you need to do is rinse off and pat your skin dry. Ideally, to see effective results - it is best to use the Liquid Peel about 2-3 times a week. Overall, the Liquid Peel has been a popularity in my beauty cabinet. I've constantly been reaching for this product several times a week because of how clean and fresh it has left my skin feeling afterwards. In terms of its gel to peel technology, it really is amazing to see how the impurities look to clump up and right after rinsing, it leaves you with a healthy and radiant glow. Available at here online or at your nearest The Body Shop store. What are your thoughts on the Liquid Peel by The Body Shop? Thank you The Body Shop for supporting me for this review. My reviews are based on my own experiences and I only recommend products that I truly believe in.